I recently returned from a press trip to Montpellier, France, where I attended the 20th year of Millésime Bio World Organic Tradeshow. It was a wonderful, delicious, educational trip and I enjoyed every second of it (well, maybe not the bit about having a horrid cold for the last couple days and during the airplane ride home, but that’s a story for another time). This trip was a real eye-opener for me. There were lots of fun events organized for us around the tradeshow, but the tradeshow itself was simply amazing – there were vintners from 750 organic and biodynamic® wineries from all around the world offering tastes of their wines in the huge exhibition hall. It was a little daunting – most wineries were offering tastes of several of their wines, times 750 – that’s a lot of wine even for a professional wine wench like me. Fortunately, there were huge empty imperial bottles (an imperial bottle holds the equivalent of 12 bottles of wine) with big funnels in the top next to each table. Those were our spit buckets, and believe me I used them. Sometimes a gal’s just gotta spit. I’ll come back to the trade show in a little while – I want to share the trip with you in sequence. That way, you’ll get a better feel for the trip in its entirety. Before I get into the meat of the trip, I want to thank my friend Veronique Raskin, of The Organic Wine Company (www.theorganicwinecompany.com) – she has been involved with the event since its inception and was very instrumental in getting us American journalists over there to experience it and write about it. 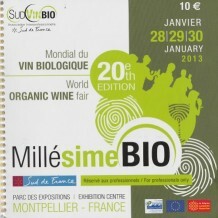 I would also like to thank the organizers of the Millésime Bio World Organic Tradeshow – Sudvinbio and Clair de Lune (especially Roxane Pinault – her gracious hospitality and care of us journalists went above and beyond). Together, they seamlessly orchestrated a well-organized, unforgettable journey. First off, there was the flight there. It was long. We (I say we, because my husband Tim joined me for this trip) flew Air France from San Francisco and left at 3:30PM. We flew all night and arrived in Paris at 11:00AM and caught a smaller jet to Montpellier, where we arrived about an hour later, bleary-eyed and punchy. We checked in to our hotel room at the Mercure Antigone and promptly fell asleep for a few hours. That evening, Tim stayed in and I was treated to a delicious dinner with my fellow journalists and the organizers of the fair at a wonderful nearby restaurant, la Compagnie des Comptoirs. The food, wine and company were fabulous! After dinner, I returned to my room and fell asleep within seconds of my head hitting the pillow. We started the next day at breakfast in the hotel’s restaurant. Oh. My. God. This place has a breakfast buffet like I’d never seen before – all the usual breakfast fare, such as cereal, yogurt, eggs, bacon, toast etc., plus croissants and an amazing selection of cheeses, patés and charcuterie. And the coffee was epic. After breakfast, we boarded the deluxe bus and took off for the Natali & Coe oenological laboratory in nearby Saint-Clément de Rivière, where we tasted through 90 organic wines of the region – it was fascinating! This lab not only analyzes the wines, they also advise local vintners about viticulture and winemaking techniques. After we were finished tasting and discussing the wines, they fortified us with tiny cups of strong coffee and sent us on our way. Our next stop was a delicious buffet lunch at the Clos de Oliviers à St Gély de Fesc. Refreshed and ready to roll after lunch, we once again trundled onto the bus and headed out to visit Abbaye Sylva Plana, a wonderful organic winery in Laurens. The hour-long bus ride there was very interesting – we cruised down modern highways as well as through ancient narrow, twisting cobbled village streets. We soon arrived at the hilltop vineyard – it was a cold, gray, windswept day and some of us shivered as we walked through the schist (a type of limestone) soil looking at the knee-high, head-pruned Grenache vines and the gently rolling, winter-bare, vineyard-striped hills below. After our vineyard tour, we re-boarded the bus and visited the winery’s tasting room, where we enjoyed a tasty selection of their wines and an informative presentation about wines of the Languedoc-Roussillon region. Incidentally, Languedoc-Roussillon is in the far south, extending from the mouth of the Rhône into the Mediterranean Sea, and westward to the foothills of the Pyranees near the Spanish border. After the presentation, it was back on the bus and back to Montpellier, where we met with a few more local winemakers for an unforgettable dinner at Le Petit Jardin Restaurant. The next morning, after another round at the hotel’s amazing breakfast buffet, it was off to the Millésime Bio World Organic Tradeshow. All journalists scattered and tackled the huge array of wines in their own fashion – I started with the wines of Alsace, then Champagne (I used the alphabetical approach). I don’t have enough room here to review the wines I tasted, but suffice it to say most of the wines were stunningly good. Around 2PM, I needed a break, so I wandered over to the lunch buffet and was impressed by the wonderful job the Tradeshow did with the food – it was hot, plentiful and delicious (and they were feeding thousands of people). After lunch, I ran out of steam and headed back to my hotel for a nap. Tasting a gazillion wines plus jetlag is a tough combination, even for me. That night, there was a big gala dinner with live gypsy guitars, but I was too wiped out to go. I stayed in my hotel room and slept. The next day was a replay of the previous day – another amazing breakfast, then off to the Tradeshow. I decided to “taste around the world,” so I made a point of tasting wines from every country that was represented there, including Austria, Egypt, Chile, Italy, Germany, Portugal, Spain, South Africa, Switzerland and one winery from the US, whose wines I found sadly disappointing. After my “world tour,” I enjoyed another delicious buffet lunch at the Tradeshow, and then headed back to my hotel room. I had been feeling really tired all day, and by the time I got back to my room, I had the chills and was starting to cough. Alas, I caught the mother of all colds and ended up lying low for the rest of the trip. My darling husband Tim went out and got me food and cold supplies and I generously shared the bug with him. I missed a couple of events, because I was just too ill (and contagious, I’m sure), but the other journalists assured me that I had attended the most relevant ones. Coughing and blowing our noses (and getting nasty looks from the other passengers), Tim and I boarded the plane for the long flight home, sick and exhausted, but oh-so-glad that we had been able to go on such a fun, educational and overall wonderful trip. I hope they invite me back next year!